Set up and delivered by the Tigers Trust, the Hull City Enterprise Academy uses the power of football and Hull City as a business to engage and inspire young people to learn about enterprise and the world of work. The work undertaken by staff also aims to develop young people's confidence, self-esteem and teamwork amongst other skills. The programme has developed since its first delivery back in April 2018 to ensure it caters for the needs of students from a variety of schools who all have different social and personal reasons for taking part. Over the course of the last year on delivery, the Trust has engaged with over 300 students on the programme, working with 15 different school establishments across Hull and the East Riding. One of the first schools on the programme with the Trust was Winifred Holtby Academy in East Hull. With this school alone, the Trust has worked with over 60 students as part of the Enterprise programme and Premier League Enterprise Challenge. The Trust is also always keen to find out the views of its participants and students have fed back positively about their experiences. One student wrote “I love this part of Tuesday” whilst another said, “It was fun and I feel more confident in myself”. One student had missed a whole week of school in the previous month to starting the programme with the Trust. Since commencing the programme, he attended every session and did not miss a single day of school in the following month. Like many other students who attended all 20 hours, he received the Entry Level 3 ASDAN qualification for Enterprise. As a direct result of his engagement with the Trust, the student stated “I feel confident in my communication, team work and taking the lead in discussions. I loved every part of the programme”. The Trust has seen similar success stories over the last year the programme has been running and will continue to support students across Hull and East Riding from April until the end of the programme in July. Pictured - A group from The Hub at Winifred Holtby Academy celebrating completing the Enterprise Academy programme in March 2019 with Hull City ambassador, Dean Windass. Yesterday, The Hub hosted their first Art Exhibition. It was a huge success with many visitors from WHA, Tweendykes, Governors and parent/carers. The pupils led the event to a high standard and can’t wait to host similar events throughout the year. A massive thank you to everyone who came and supported the exhibition. The pupils were an absolute joy and it was fantastic to see so many staff support them. A big thank you for also filling out the feedback forms. 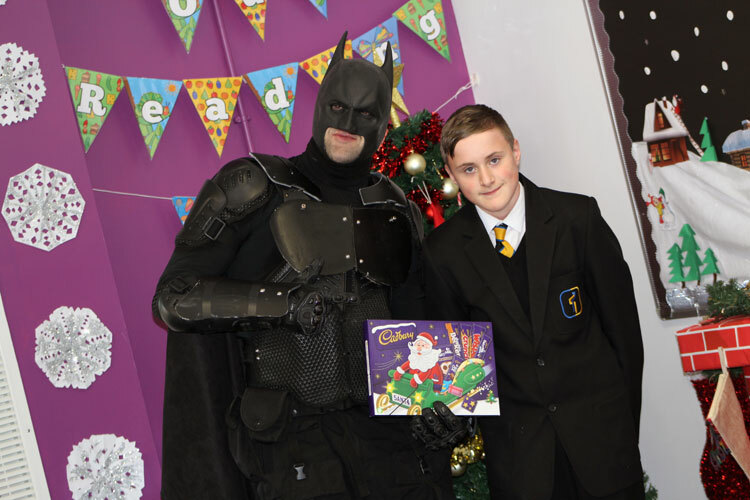 Today we had a surprise visitor at the Academy, The Caped Crusader stopped by and visited 'The Hub' bringing them a Cadbury’s selection box for Christmas. The pupils had their photograph taken with him and have been provided with a glossy A3 photo souvenir print to take home of them with Batman. Thank you to Lesley from Tweendykes for arranging this. Yesterday, the Hub hosted their first sporting event. Sports captains were invited to take part in a competition to see which House could score the most hoops in 1 minute. It was a tight competition with Team Seftholme taking the lead and Team Sudtone/Hedoncrofte coming a close second.